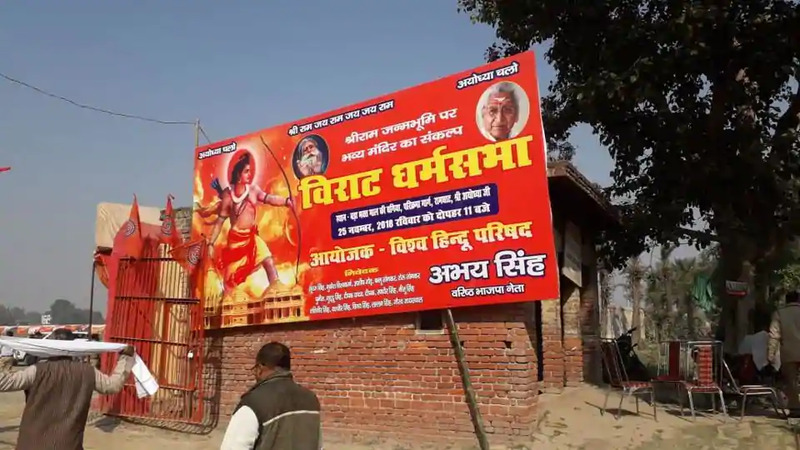 A day before the Dharam Sabha called by the Vishva Hindu Parishad, Ayodhya was virtually turned into fortress with multiple layers of security and deployment of drones to keep an eye on possible mischief- mongers. Ayodhya: A day before the Dharam Sabha called by the Vishva Hindu Parishad, Ayodhya was virtually turned into fortress with multiple layers of security and deployment of drones to keep an eye on possible mischief- mongers. A UP Police spokesperson said one additional DGP, one deputy inspector general (DIG), three senior superintendents of police (SSPs), 10 additional SPs, 21 deputy SPs, 160 inspectors, 700 constables, 42 companies of PAC, five companies of RAF, ATS commandos and drones were deployed here. When contacted, Ayodhya mayor Rishikesh Upadhyay told that adequate security arrangements were made by the police and district administration in the town, located 120 km from state capital, Lucknow. "As many as 13 parking slots have been provided for the event. 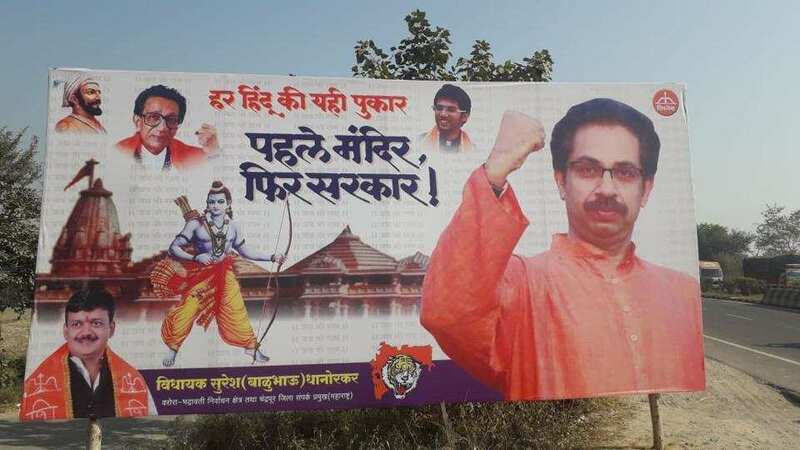 No permission was given to the Shiv Sena by the government to hold a rally," the mayor said. Despite a slight chill in the air, the temple town seems to be reeling under the political heat generated by the 'Dharam Sabha', being held to call for the construction of a grand temple for Lord Ram here. A pamphlet recently released by the VHP raises the pitch for its construction. 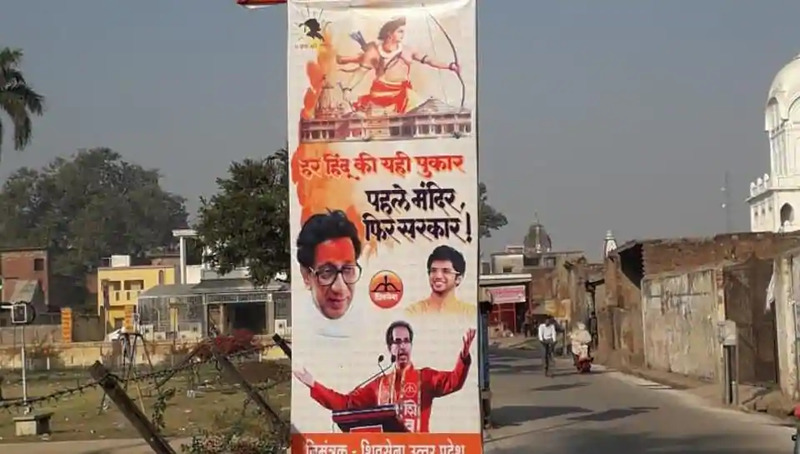 It reads "Saugandh Ram ki khaate hai, hum mandir bhavya banayenge (We pledge in the name of Lord Ram that we will build a grand temple for him)" and urges devotees to be a part of the movement. Vishva Hindu Parishad was founded on August 29, 1964 on the auspicious day of Shri Krishna Janmasthami. Its objective is to organise, consolidate the Hindu society and serve, protect the Hindu Dharma. 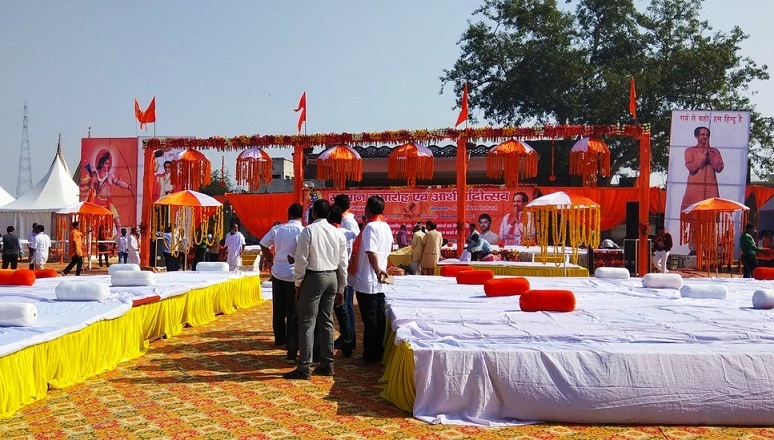 The organisers of the Dharam Sabha claim the more than 3 lakh devotees of Lord Ram were likely to arrive for the programme this Sunday. VHP media in-charge Ambuj Ojha said, "After staying in a 'taat' (tent), Lord Ram is expecting a revival of bravado among his devotees. The moment has come. The temple must be built where Ram Lalla is currently seated. Also, there should not be any mosque in the cultural boundary of Ayodhya." On November 18, the VHP had organised a motorcycle rally in different parts of Lucknow in this regard. Praant Sangathan mantra (Awadh) of VHP Bholendra in a written statement said this was the final Dharam Sabha for construction of Ram temple. "After this, no more Dharam Sabhas will be held and the construction of the temple will commence," he said. The Supreme Court on November 12 had declined early hearing of petitions in the Ram Janmabhoomi-Babri Masjid title dispute case. A bench comprising Chief Justice Ranjan Gogoi and Justice S K Kaul had said it already listed the appeals before the appropriate bench in January. Earlier, a three-judge bench, by a 2:1 majority, refused to refer to a five-judge constitution bench the issue of reconsideration of the observations in its 1994 judgement of the Allahabad High Court that a mosque was not integral to Islam.